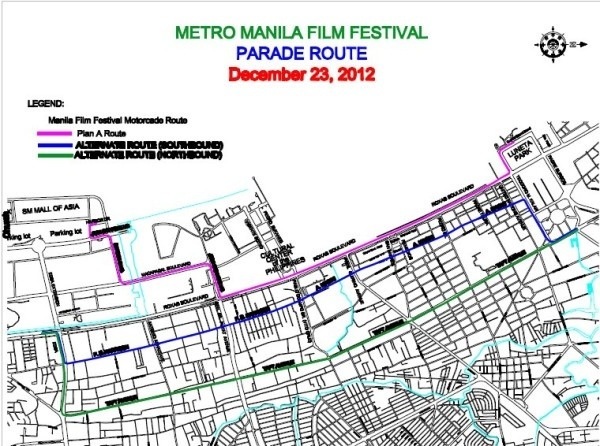 Alternate Routes for MMFF's "Parade of Stars"! Alternate Routes for MMFF’s “Parade of Stars”! Sharing MMDA’s traffic re-routing scheme for MMFF’s “Parade of Stars” on December 23, 2012 to help you maneuver your way around the metro. Parade starts in front of the Quirino Grandstand left turn at T.M. Kalaw, right turn to Roxas Blvd., right turn at Buendia Avenue, left at Macapagal Avenue, right at Seaside Blvd., left at Jose Diokno Blvd., right at Harbor Drive, drop off point at Block 21 within SM MOA Grounds. Southbound – From T.M. Kalaw, left turn at A. Mabini straight to F. B Harrison, right turn to EDSA, left to Roxas Blvd. You are Here >> Home » Events » Alternate Routes for MMFF’s “Parade of Stars”!